Medicines for Europe represents the generic, biosimilar and value added medicines industries across Europe. Its vision is to provide sustainable access to high quality medicines, based on 5 important pillars: patients, quality, value, sustainability and partnership. Its members employ 160,000 people at over 350 manufacturing and R&D sites in Europe, and invest up to 17% of their turnover in medical innovation. Medicines for Europe member companies across Europe are both increasing access to medicines and driving improved health outcomes. 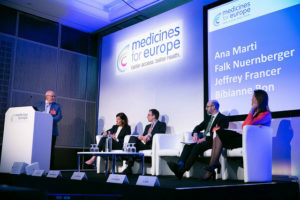 They play a key role in creating sustainable European healthcare systems by continuing to provide high quality, effective generic medicines, whilst also innovating to create new biosimilar medicines and bringing to market value added medicines, which deliver better health outcomes, greater efficiency and/or improved safety in the hospital setting for patients. For more information please follow us atwww.medicinesforeurope.com and on Twitter @medicinesforEU.